The Widjiwagan progression of challenge culminates with the advanced trips programs, which give experienced, qualified campers the added challenge of traveling in more remote areas for a longer duration. Qualified campers refine their skills in wilderness travel, group dynamics and leadership. These trips are invite-only. Campers are invited if they demonstrate an enthusiasm for wilderness travel, initiative and the ability to work well with others. Advanced Trip Invitations will be sent by the end of November. The Advance Camper Lottery takes place in January, not in December with regular trips. Because our priority is to put together the strongest groups possible by factoring in the strengths of each individual camper, we do not honor friend requests at this level. If you have been a Widji camper, are currently in grades 10–12 and would like more information, please contact us. Most Advanced Camper Invitations have been sent out at this point. Every year, a few folks have trouble receiving their invitations due to changes of address or other clerical issues. If you have a camper who is currently in 10th, 11th or 12th grade and you have questions about the Advanced Camper Invitation process, please contact Amy Hadow, Summer Program Director. Sessions range from 30 to 31 days, with 19 days on trail. Recent groups have explored the Wind River Range in Wyoming and the Sawtooth Wilderness Area in Idaho. Sessions are 33 days, with 22 days on trail. 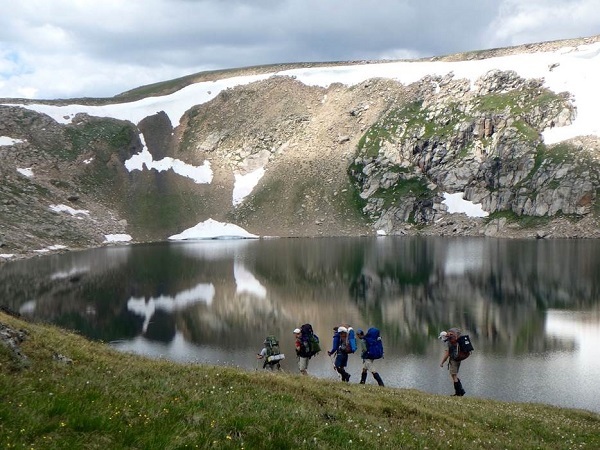 Recent groups have traveled to the Beartooth Wilderness in Montana and the Willmore Wilderness in Alberta, Canada. Sessions range from 45 to 48 days, with 35 to 40 days on trail. This trip travels to the mountain ranges of Alaska and Canada. Recent groups have hiked in Gates of the Arctic National Park, Arctic National Wildlife Refuge and Wrangell-St. Elias National Park in Alaska, and the Ogilvie Mountains in the Yukon Territory of Canada.